This article is about the news magazine. For the news channel, see India Today Television. India Today is a fortnightly Indian English-language news magazine published by Living Media India Limited. In 2014, India Today launched a new online opinion-orientated site called the DailyO. 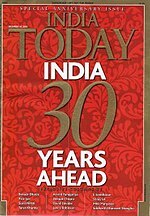 India Today was established in 1975 by Vidya Vilas Purie (owner of Thompson Press), with his daughter Madhu Trehan as its editor and his son Aroon Purie as its publisher. At present, India Today is also published in Hindi, Kannada, Tamil, Malayalam and Telugu. The India Today news channel was launched on 22 May 2015. In October 2017, Aroon Purie passed control of the India Today Group to his daughter, Kallie Purie. ^ "India Today Group". India Today Group. Retrieved 28 September 2010. ^ Douglas Bullis (1997). Selling to India's Consumer Market. Greenwood Publishing Group. p. 46. ISBN 978-1-56720-105-5. Retrieved 7 May 2016. ^ Advertising N Promotion. Tata McGraw-Hill Education. 2009. p. 713. ISBN 978-0-07-008031-7. Retrieved 5 May 2016. ^ Vivek Pai (15 September 2014). "India Today Group launches Medium clone DailyO". Medianama. Retrieved 27 March 2019. It looks like The India Today Group has launched a new opinion-oriented site called DailyO that provides commentary on news from various categories like politics, sports, life, sci-tech, money, humour and art & culture. ^ The Far East and Australasia 2003. Psychology Press. 2002. p. 490. ISBN 978-1-85743-133-9. Retrieved 2 June 2016. ^ Bhandare, Namita. "70's: The decade of innocence" Archived 2012-08-17 at the Wayback Machine.Hindustan Times. Retrieved 29 July 2012. ^ "India's Top 50 Influentials". Daily News and Analysis (DNA). 1 January 2009. Retrieved 7 July 2018. ^ Ray, Shantanu Ray (18 October 2017). "Aroon Purie hands over reins of India Today to daughter Kallie; appoints her as group vice-chairperson". First Post. Retrieved 5 December 2017. This page was last edited on 27 March 2019, at 18:07 (UTC).